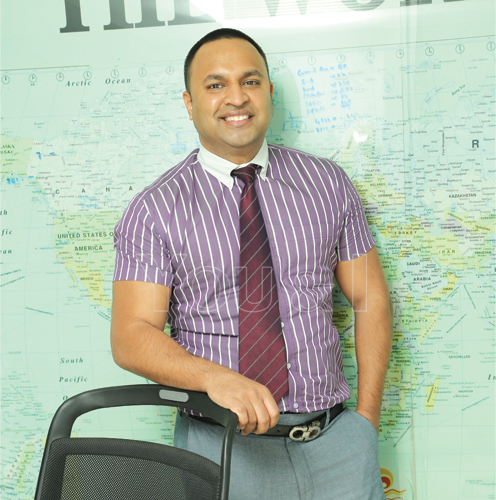 A leader in true spirit, Siddharth Reddy is the CEO of Country Club Hospitality and Holidays Limited. A name synonymous with splendid holiday destinations, clubbing hubs, trendy fitness centres, and star-studded entertainment events, Country Club has been helping people make happy memories for over three decades. 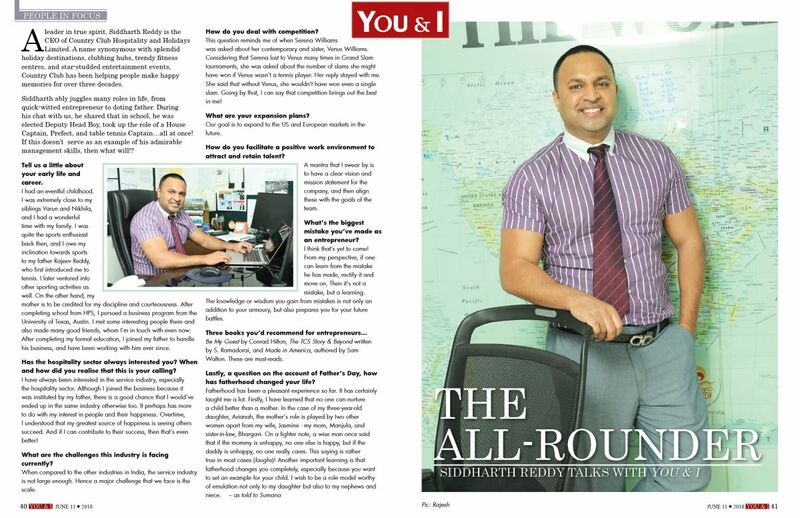 Siddharth ably juggles many roles in life, from quick-witted entrepreneur to doting father. During his chat with us, he shared that in school, he was elected Deputy Head Boy, took up the role of a House Captain, Prefect, and table tennis Captain…all at once! If this doesn’t serve as an example of his admirable management skills, then what will!? Tell us a little about your early life and career. I had an eventful childhood. I was extremely close to my siblings Varun and Nikhila, and I had a wonderful time with my family. I was quite the sports enthusiast back then, and I owe my inclination towards sports to my father Rajeev Reddy, who first introduced me to tennis. I later ventured into other sporting activities as well. On the other hand, my mother is to be credited for my discipline and courteousness. After completing school from HPS, I pursued a business program from the University of Texas, Austin. I met some interesting people there and also made many good friends, whom I’m in touch with even now. After completing my formal education, I joined my father to handle his business, and have been working with him ever since. Has the hospitality sector always interested you? When and how did you realise that this is your calling? I have always been interested in the service industry, especially the hospitality sector. Although I joined the business because it was instituted by my father, there is a good chance that I would’ve ended up in the same industry otherwise too. It perhaps has more to do with my interest in people and their happiness. Overtime, I understood that my greatest source of happiness is seeing others succeed. And if I can contribute to their success, then that’s even better! What are the challenges this industry is facing currently? When compared to the other industries in India, the service industry is not large enough. Hence a major challenge that we face is the scale. This question reminds me of when Serena Williams was asked about her contemporary and sister, Venus Williams. Considering that Serena lost to Venus many times in Grand Slam tournaments, she was asked about the number of slams she might have won if Venus wasn’t a tennis player. Her reply stayed with me. She said that without Venus, she wouldn’t have won even a single slam. Going by that, I can say that competition brings out the best in me! Our goal is to expand to the US and European markets in the future. How do you facilitate a positive work environment to attract and retain talent? A mantra that I swear by is to have a clear vision and mission statement for the company, and then align these with the goals of the team. What’s the biggest mistake you’ve made as an entrepreneur? I think that’s yet to come! From my perspective, if one can learn from the mistake he has made, rectify it and move on. Then it’s not a mistake, but a learning. The knowledge or wisdom you gain from mistakes is not only an addition to your armoury, but also prepares you for your future battles. Be My Guest by Conrad Hilton, The TCS Story & Beyond written by S. Ramadorai, and Made in America, authored by Sam Walton. These are must-reads. Lastly, a question on the account of Father’s Day, how has fatherhood changed your life?